We all know that we SHOULD read the Bible... but do you actually enjoy it? Do you look forward to it? Or is it a task that we do because we are supposed to, not because we want to? 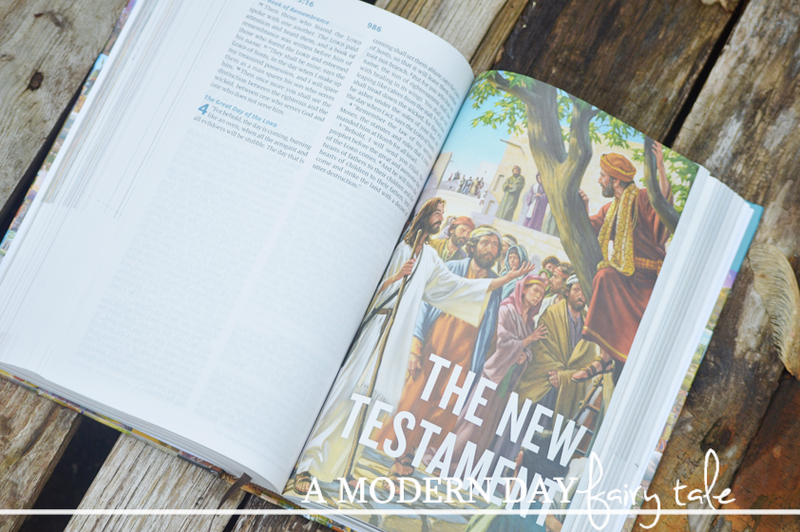 If I were to be entirely honest, I go through stages... there are parts of the Bible (primarily the New Testament) that I love reading over and over again...if not full books, passages that mean a lot to me. Other parts- like some of those Old Testament books? Well, yes, those seem to be more of a chore. As a mom, I don't want my children to see Bible reading as a chore. I want them to love learning about all of these amazing stories. I want them to better understand why these stories are important and how we apply them to our every day lives. I want them to grow up reading and loving the Bible. As much as I want my child to know their Bibles, I must admit, I'm not always sure where to begin teaching them. Of course I know many of the stories, but how do I make sure they are understanding what they read? What questions can I ask to make sure they heard what I was telling them? How do I best remind them how those stories apply to our lives today? This Bible truly is perfect for that. 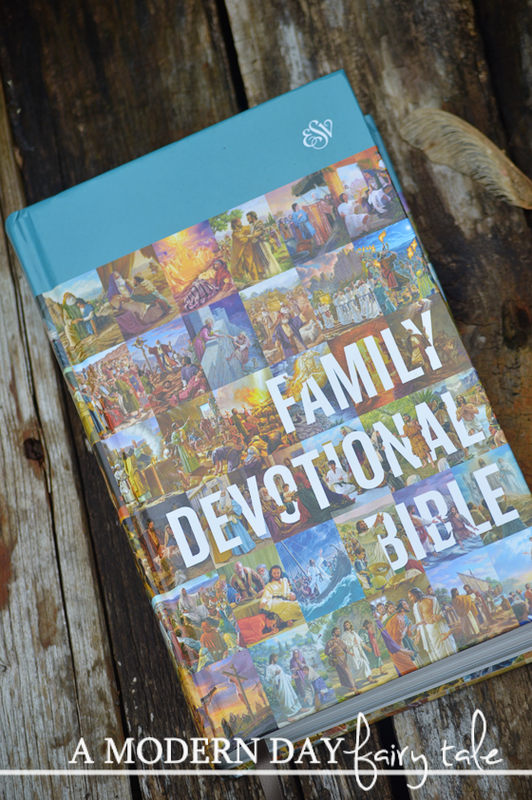 Throughout the pages we find devotionals with some of the great stories in the Bible. 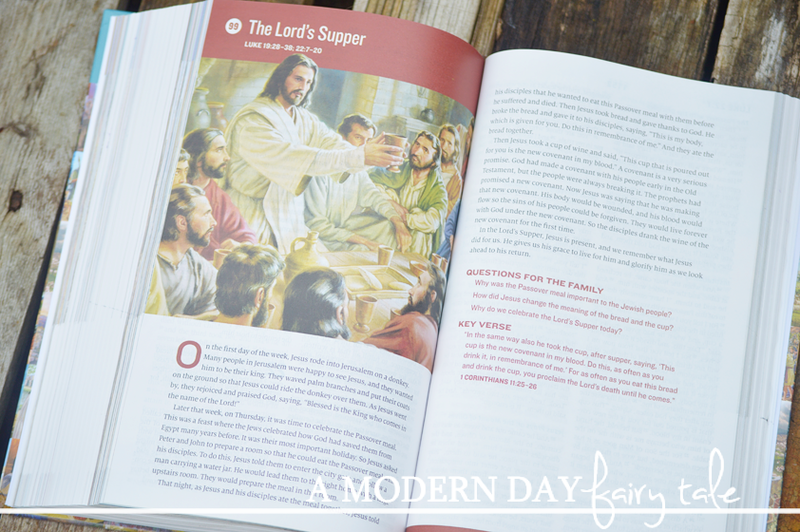 Each one features a full page color image to help bring in little one's attention and shares a brief summary of the Bible story at hand- as well as the reference so we can read more in depth into the story. Each reading is also followed by three questions to help further the conversation. These questions not only help us all to better understand what we have read, but also to understand how those lessons can be applied to our life today. Each devotion is ended with a key verse that truly sums up the story we've read, and can also serve as a good memory verse too. As much as I love the actual devotional part of the Bible, the first thing that caught my eye were the illustrations. When I was a child, I remember going to my doctor's office where they had these old Bible story books... they must have been older even then 20 some years ago. But they were classic and timeless and truly stuck with me through all of those years. The illustrations in this Bible remind me very much of those old picture books from my childhood. These are pictures that will feel dated in just a few years, but will really hold their appeal throughout the years, making it great not just to read now with my own family, but to pass down to theirs as well. What a wonderful habit to begin when your kids are younger! This would be really nice to give to my son for his family. I love the color pictures in this Bible so nice. This would be such a sweet gift to give! The pictures and questions are great! This would be great for my nieces. Love the pictures for the kids! I love this!! I wish it was NASB but at least it isn't NIV or KJV (it seems like most of the interesting devotional Bibles are one of those two translations). The google share link and twitter share link got switched today. This is a habit that I should start incorporating as one of our family's daily routine. Not only will this keep as close together but can guide us in running our daily lives. I've read a lot of good storied from buy college papers at PapersBoard.com regarding reading the Bible as family which are really very inspiring.